D. Casey Kerrigan, MD, is founder and designer of OESH shoes. Courtesy OESHSHOES.com. D. Casey Kerrigan, MD, isn’t a product designer. And yet, that’s exactly what she is. What sounds like a contradiction isn’t at all. Rather, it’s the axiom of a new era in product design—an era in which anyone can leverage technology to turn expertise into ideas and ideas into inventions. Anyone can learn how to become a product designer. “I’m a good example of how democratization of design technology can allow a physician-scientist, with no prior background in design, to improve how shoes are designed and made,” says Kerrigan, who six years ago left her job as a tenured professor at the University of Virginia to establish OESH, a company that designs and manufactures “responsive” women’s footwear. OESH La Vida. Courtesy OESHSHOES.com. The journey from scientist to shoemaker began more than 20 years ago, when Kerrigan became interested in biomechanics as a student at Harvard Medical School. A former runner, she attended a lecture on gait—the science of walking and running—and became fascinated by the impact of footwear on the human body, which she studied for nearly a decade before publishing a groundbreaking paper in 1998 establishing, for the first time, a link between high-heeled shoes and knee arthritis in women. The culprit isn’t necessarily the height or size of shoes’ heels. The contouring and cushioning of their soles also interfere with the body’s natural range of motion. 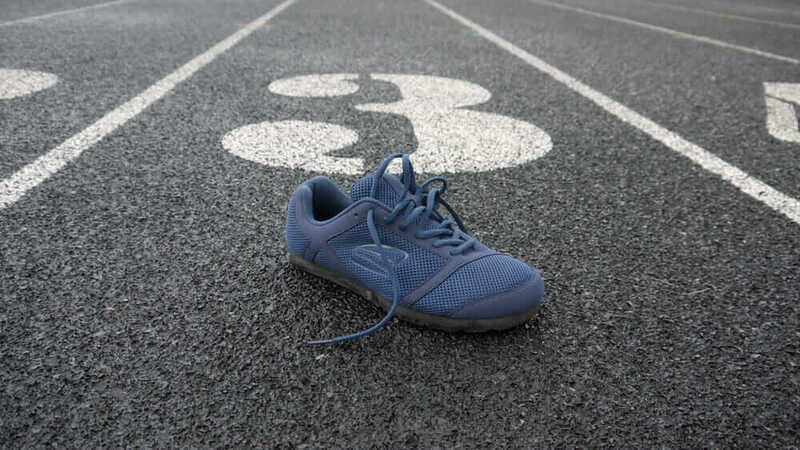 She tried to license her idea—shoes with flat, springy soles that support the body’s natural biomechanics—but existing shoe manufacturers were more interested in form than function. 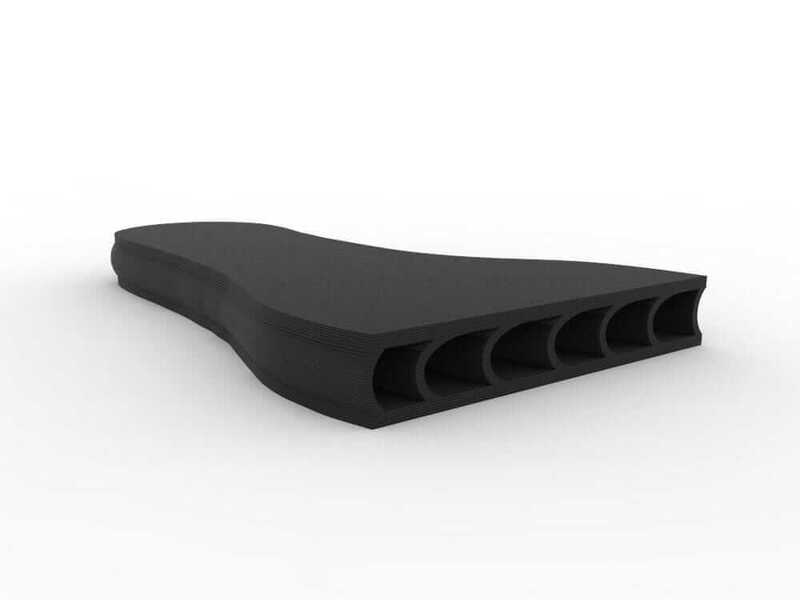 Digital rendering of an OESH shoe sole. Courtesy OESHSHOES.com. Kerrigan’s shoes didn’t just have a different agenda. They also had a different makeup: Unlike most shoes, the soles of which are made from an elastic plastic known as ethylene-vinyl acetate, hers are made from a unique elastic composite material that she developed. Not only is the material unique, it is incorporated into a cantilevered structure in the sole that does not “cushion” but rather “responds” to body-weight forces when they are at their greatest. The shoe industry didn’t know how to work with the material Kerrigan developed, nor did it have equipment that could incorporate that material into Kerrigan’s sole designs. So, Kerrigan established her own DIY laboratory and factory in Charlottesville, Virginia, where she taught herself how to design, model, and manufacture with a variety of design tools, including Autodesk AutoCAD and, finally, Autodesk Fusion 360, which she currently uses to manage the entire production process, from initial design through final fabrication. D. Casey Kerrigan shows off molds for OESH shoes. Courtesy OESHSHOES.com. 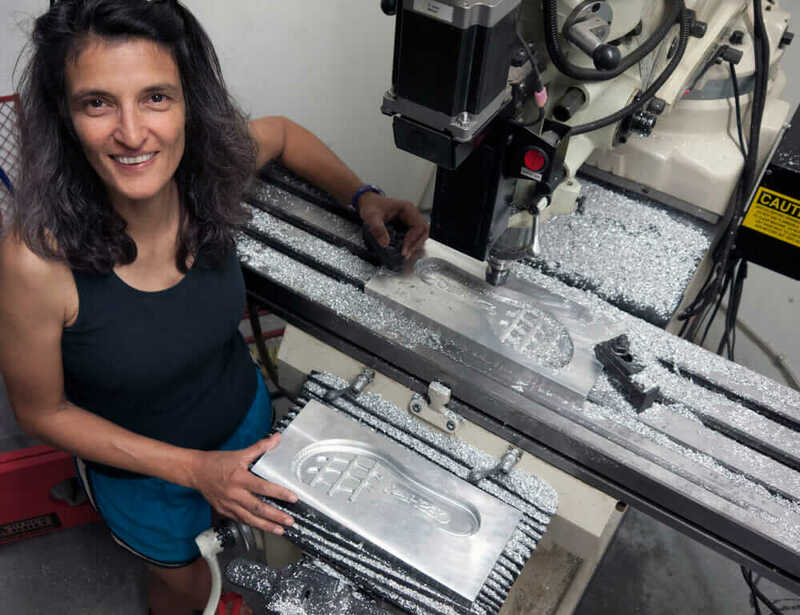 “The idea of learning CAD was very daunting, but it ended up being very straightforward and intuitive,” says Kerrigan, who uses the software to operate her own water-jet cutter and milling machine to produce her shoe soles on site. Kerrigan spent about a year perfecting her initial design through trial and error and began selling her homegrown shoes online in 2011. OESH has been growing and expanding ever since. The technology didn’t just turn Kerrigan into an inventor. 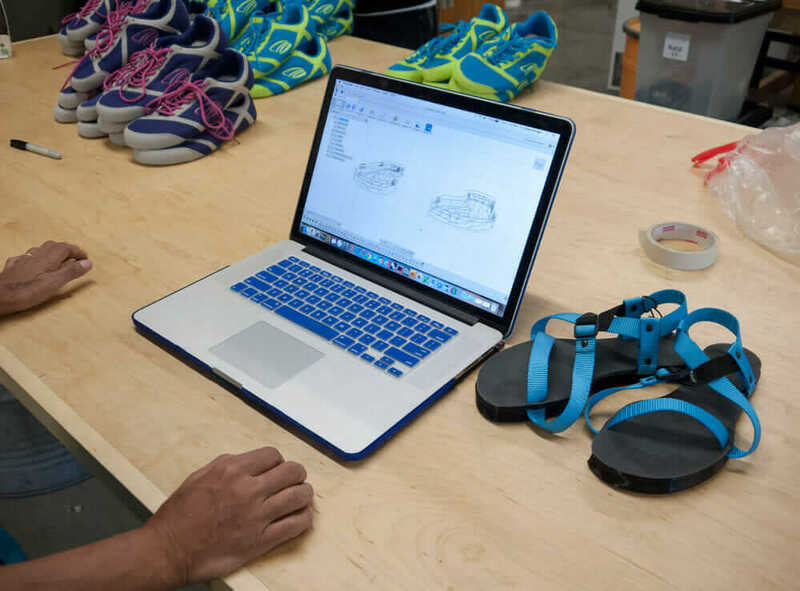 It also turned her into an innovator: Last year, she began using CAD to design and fabricate a dozen specialized 3D printers capable of 3D printing her patented shoe designs, the first of which—a line of 3D-printed sandals—arrive this summer as OESH’s Athena Collection. 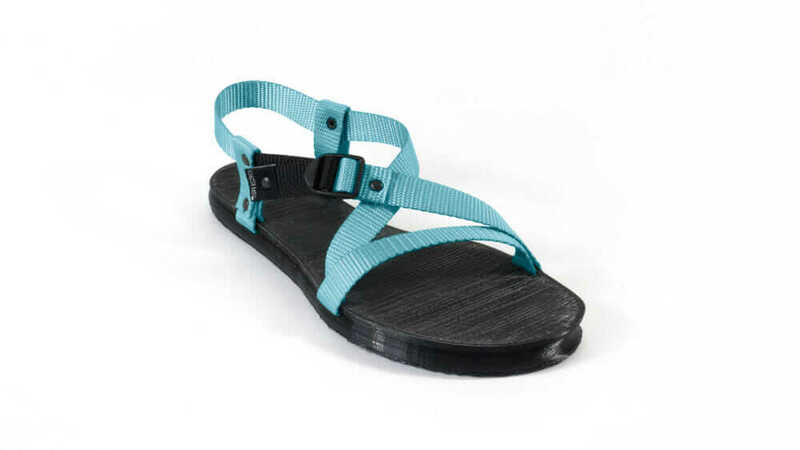 3D-printed Athena sandal. Courtesy OESHSHOES.com. “We’re the first to sell a truly functional 3D-printed shoe,” says Kerrigan, who eventually plans to use 3D printing to fabricate the tops of her shoes, which she currently imports from Asia. The result, she boasts, will be a shoe that’s 100 percent made in America—and, one day perhaps, entirely custom made. “I think that’s where things are going: Instead of injection-molding the same part a billion times, technology will make it possible for manufacturers to embrace many different designs that fit many different needs,” she says. Not only many different designs but also many different designers. Perhaps even you.